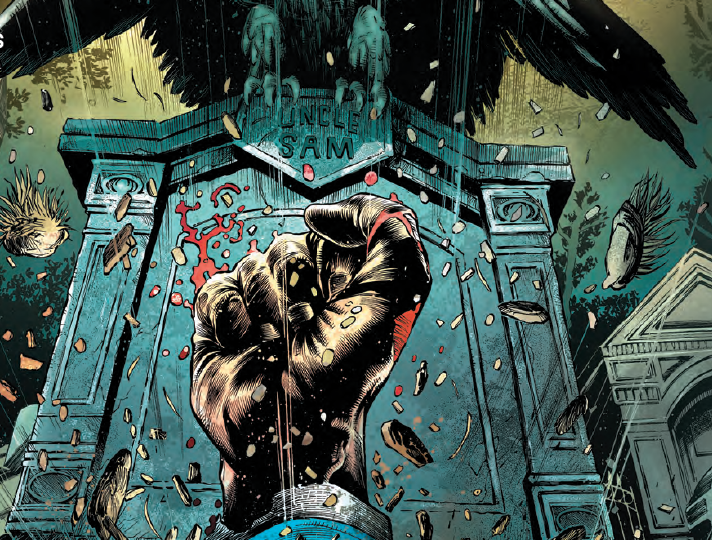 Freedom Fighters #4 Review – AiPT! Uncle Sam called. He wants his country back. Imagine a world where Nazis ruled the world. Now imagine that world after it defeated all your greatest American heroes. What hope do we have? Well, in the case of Freedom Fighters it appears time can heal wounds. The Nazi regime has just lost their leader Hitler and his son has taken over. They’ve grown pathetic and complacent with their rule. Time for the big wig American heroes to step up their game. This issue continues the epic run Robert Venditti and Eddy Barrows have explored. The villainous Ratzis still rule all, but their power is waning thanks to clear eyes and open hearts of the citizens who believe in a better and more patriotic America. As the cover suggests Uncle Sam, who has seemed to be long dead, is making a triumphant return. All it takes is a little hope and a little fear from the Nazi bastards. This issue develops Hitler’s son who is now the ruler. He has a son of his own who appears to be a psychotic torturer and will most likely end up being a major threat to the resistance. Before we get there though this issue shows more of what we want which is Nazis losing and heroes gaining more of an advantage. Uncle Sam is so damn cool in this issue. He’s practically a god in how he’s depicted and he adds a mystical nature to the heroes side of things. Most of these heroes are grounded and human with their own faults. We see plenty of that in a great scene with Human Bomb, who can’t touch a thing without it exploding. If Hitler’s son’s son is the embodiment of pure evil it’s nice to see Uncle Sam may be the embodiment of hope. The comic is showing how you can mix reality with superheroism in very creative ways. Barrows draws another great issue. The level of detail is astounding, just look at the crowded ceremony scene in front of the mountain below. Uncle Sam looking godly and empowering is in thanks due to Barrow’s fantastic shots of the character as well as the angelic glow from color artist Adriano Lucas. The opening page with the Eagle is also striking and a symbolic visual that will stick with you. Uncle Sam continues to be a bit of a mystery. His energy is of course powered by the spirit of the Americans, but how he’ll integrate with this team is beyond me. He’s yet to be really explored and instead is more of a visage of hope. I’m greatly anticipating more development of the character. Speaking of, most of the team is not in this issue. We get a bit of them, but more time is spent with the Nazi side of things much like int he last issue. That makes you lose sight of the heroes, their mission, and personalities. A great fourth issue that begins to steer into mystical areas of heroism and hope.